The super cute Eastern Chipmunks are small members belonging to the family of squirrels. These rodents are native majorly to the regions of eastern North America and southeastern Canada. World famous cartoon and animated characters like Chip and Dale etc have been inspired by these small little animals. These animals have always amused humans by their adorable appearance and speedy food gathering activities. They are identified by their reddish brown furry body covered with five stripes, complimenting large glossy eyes and a bushy tail. Kids love to watch and observe them running around in parks and lawns with their pudgy cheeks filled with food. The bird-like chipping sounds and calls produced by these critters have earned them their name. These critters are significant for being the only members alive so far of the chipmunk subgenus Tamias. Eastern Chipmunks are identified by the dark and light stripes that adorn portions of their back and head. These colorful rodents have reddish brown fur covering the back and sides of its body. However the area of their stomach is covered with white fur. These animals have pudgy pouched cheeks that allow them to store and transport food to their burrows. 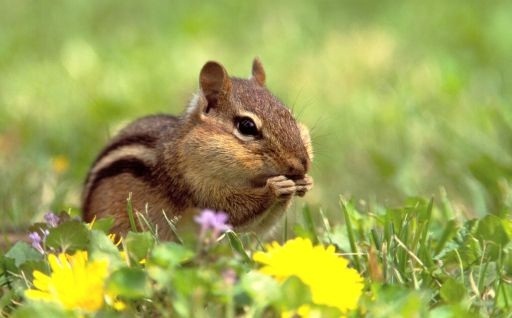 Chipmunks have two white stripes bordered by black on either sides of its body. The stripes also extend to the area above and below their eyes. Their bushy tails are generally dark. Their front legs have four toes each. Whereas the back legs have five toes each. 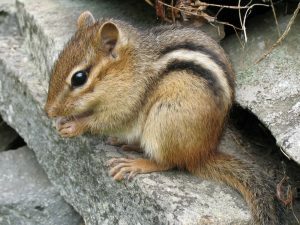 The appearance of a chipmunk and striped ground squirrel may tend to be pretty much similar, making it difficult to distinguish between the two. However chipmunks are comparatively smaller in size and also have distinct marks on their face unlike squirrels. There are five distinguished dark stripes found at the back of chipmunks. Moreover the central line that stretches towards the head makes chipmunks distinctly stand apart from squirrels. It has also been noted that the eastern chipmunks are bigger in size as compared to western chipmunks. An eastern chipmunk would approximately weigh about 125 grams. The particular species is somewhere between 20-30 cm in length. Eastern chipmunks love to feed on nuts that constitute a major portion of their diet. However these mammals also collect and feed on berries, seeds, insects, grain and fruits. Chipmunks are observed to be extremely busy and active during the daytime, collecting seeds and nuts for winter storage. These animals survive solely on insects, flowers, cherry, mushrooms, earthworms and plum pits in the spring, summer and autumn seasons. However at times they also tend to feed on eggs and dead animal flesh. There are certain extremely rare scenarios where chipmunks have preyed on smaller birds and mammals. These rodents have a reputation of being hard working food gatherers. As such they prefer a habitat characterized by dense undergrowth, rocks, logs and bushes. Moreover this kind of environmental surrounding also assists them in keeping predators like coyotes, foxes, snakes etc at bay. Sometimes you may even spot their burrows in the walls near your house or other buildings. In America, the habitat of these species of animals can be found in various surroundings right from highland forests to the shrubby deserts of southern Mexico. Their burrows are sub-divided into a number of chambers that are interconnected by tunnels. These burrows serve both as dwellings and store rooms for the food collected for the winter period. Chipmunks prefer to live in solitude and lead self-dependant lives. It is only during the mating season that these creatures are observed to be interacting amongst partners or groups. The adult male chipmunks defend an area stretching to about 50 meters from the entrance of their burrows. Chipmunks are strategic animals. In order to survive the chilly weather these rodents go into a sort of hibernation during the winter months. As such they thrive on the food stored inside their little burrows. These animals have a way of hiding their burrows from the much feared predators. They trick the snakes and other predators by depositing the dirt that they dig, to a different location altogether away from the burrow. These creatures use their cheek pouches to carry the dirt and accomplish the task. Chipmunks also camouflage their burrows with rocks, sticks, leaves and other materials to confuse the predators in locating them. These cute looking rodents are found throughout the southern regions of Canada and eastern United States. Some have even been spotted in the semi-desert areas home to western United States. These creatures can be traced to thrive further south in mountainous regions of Mexico. It is important to remember that these animals do not prefer to dwell in marshy areas. People and especially kids love to watch these super busy animals running around in the lawn and gardens. These creatures exhibit bold behavior and are unafraid when it comes to searching their food. Chipmunks are solitary in nature. They hardly interact with their own kind except during the mating period. These animals tend to defend and protect a range from a distance of 50 meters from their burrows. The homes or burrows of chipmunks are subdivided into chambers. These chambers are usually connected via tunnels. They prefer rocky or bushy areas to build their burrows. They use rocks and bushes to hide their burrows from the sight of their predators. 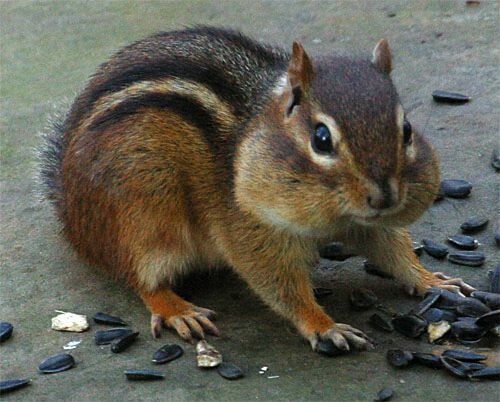 Chipmunks can fairly be categorized under the class of omnivores. Their diet majorly comprises of seeds, nuts, berries and fruits. However there are times when these animals feed on eggs and flesh of dead animals. Their burrows serve the purpose of their dwelling as well as store rooms for food. These creatures hibernate during winters. The seeds and nuts accumulated by them right from mid July, is sufficient to help them thrive throughout the winters. It is also important to remember that chipmunks are not true hibernators in the exact sense, since they do not survive on fat. By the onset of November, these creatures are ready to go underground and dwell deep inside their burrows until the warm sunny months are back. These animals come out of their burrows and begin to appear above the ground from the month of March. The breeding season of these animals begins from mid- April and lasts up to mid- May. Mating occurs near the burrow of the female. There maybe tough competition between several males for a particular female. However there are also ample scenarios of a male mating with more than one female. The period of gestation or pregnancy lasts for almost 30 days. It is usually the females who undertake the responsibility of rearing the new born chipmunks. Each litter consists of 4 to 5 young ones. Normally only one breeding season and one set of litters are associated with chipmunks. However in Canada there are certain favorable years a few of the adult eastern chipmunks can end up producing a second litter towards fall. This scenario is pretty common among both eastern and western chipmunks home to southern United States. Their pudgy cheeks have the capacity to carry up to nine nuts at a single time; four in each cheek. 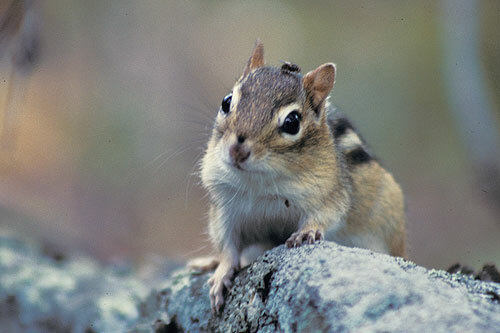 The Eastern Chipmunks are attributed with two extra front teeth as compared to other chipmunks. Even though these animals take refuge inside their burrow throughout winter, they are not true hibernators. During the winter period, these eastern chipmunks sustain on the food that they have collected during the summer periods. They have a record of sleeping for almost 8 times in a day. Eastern Chipmunks are not endangered species. When I was a child, living in New Hampshire, we had a melanistic female Eastern Chipmunk living under our front porch. She was solid black. My sister and I would sit very quietly on the front steps and she would come out and eat peanuts from our hands. One year she gave birth to 4 babies, one black one like her,and three stripey ones like their father. She actually brought them out with her when she came to be fed her peanuts. They were so precious, and so tiny! This is the only melanistic chipmunk I have ever seen, or heard personal reports of. My comment is a question, do Eastern chipmunks burrow like moles?